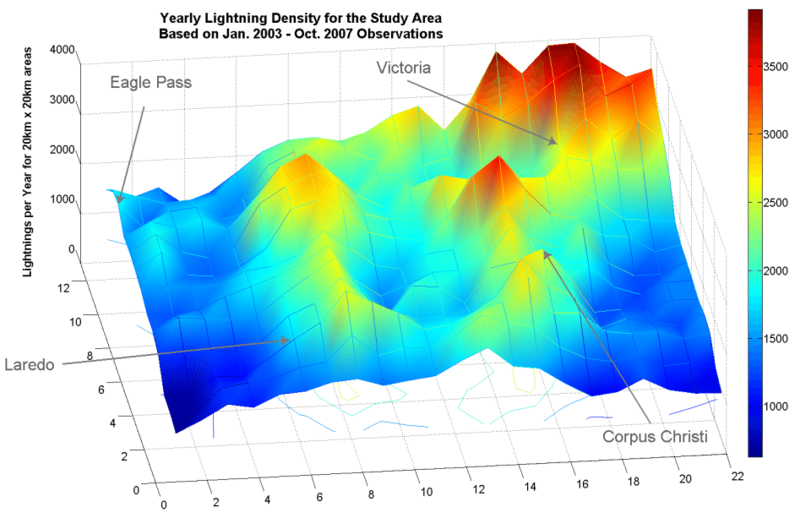 CBI in collaboration with Waylon Collins, a senior forecaster at the Corpus Christi Weather Forecasting Office is developing a model to predict the timing and location of thunderstorms. The model was presented at several AMS conferences and work is ongoing to develop an operational prototype. 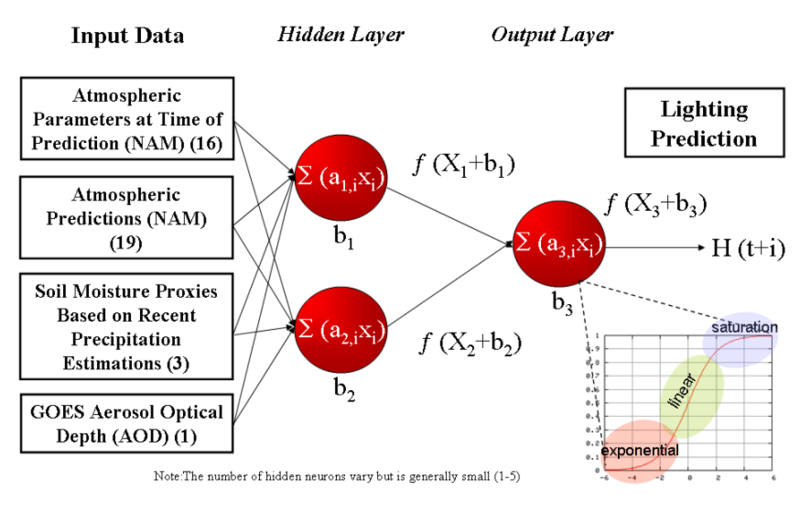 A feed-forward, supervised, multi-layer perceptron Artificial Neural Network (ANN) was developed to test the following hypothesis: An ANN can be developed to successfully forecast thunderstorm activity up to 24 hours in advance, and with a spatial accuracy of 20-km, wherein ANN inputs include selected output from (1) deterministic mesoscale Numerical Weather Prediction (NWP) models, and from (2) selected sub-grid scale data that contributes to convective initiation, or CI. The underlying logic of this hypothesis is that the NWP model output provides a forecast of whether the larger mesoscale environment is conducive to CI while the sub-grid scale data determines the extent to which convection could be triggered at a particular location. 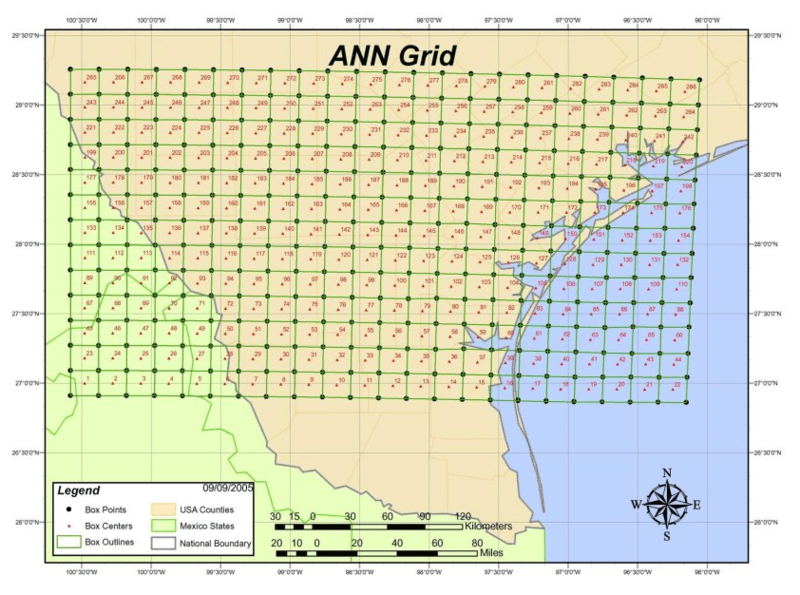 The ANN serves as a means to map the highly non-linear relationship between the foregoing inputs and thunderstorm occurrence; an ANN model to forecast thunderstorms would result. Notice that there are less lightning strikes along the arid Mexican border and in the Gulf of Mexico while there are more strikes north-east of Victoria. The data set, June 1st, 2004 to October 31, 2007, was divided into 3 parts; 40% for training, 20% for validation and 40% for testing. 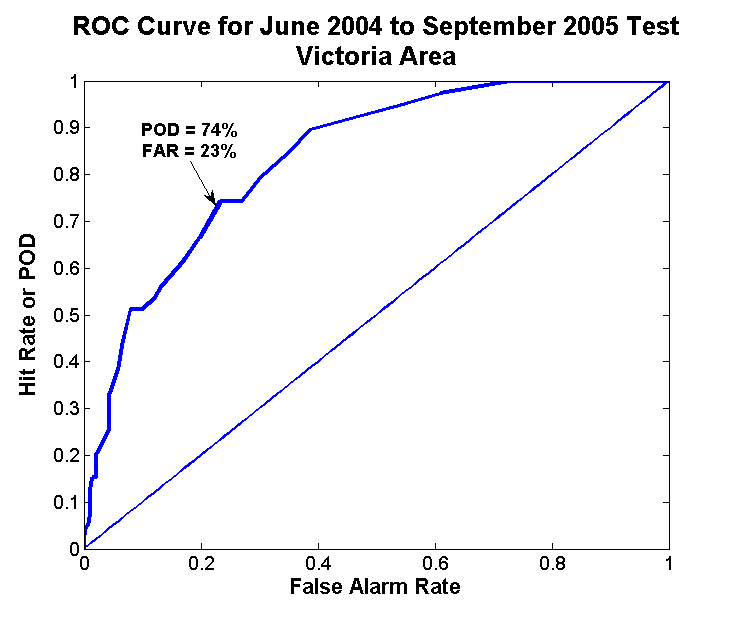 The ROC curve shows the performance of the model on a testing set (June 2004 – September 2005) for the Victoria area after being trained on the other portion of the data set.